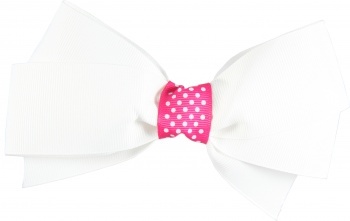 This is a white 1.5" grosgrain ribbon that is wrapped with a pink and white polka dots grosgrain ribbon. Solid white with a touch of hot pink and polka dots will match just about any outfit. It is on a French clip. This same white bow can also be wrapped with any of the print ribbon that is listed on the website. Just let us know if you would prefer this same style with a different middle color-it can be done for you.